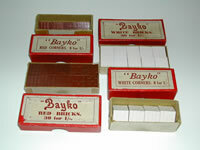 Not a mainstream BAYKO topic, but actually the evolution of BAYKO packaging across the middle third of the last century is interesting in that it reflects the general developments of UK marketing over that period. …click here for more on info. …click here for more on BAYKO Direct Sales. …click here for more on the BAYKO Storage Box. The separate pages describe the various approaches used at different times during the life of BAYKO by both Plimpton and MECCANO. …click here for more on these Packaging Anomalies. …click here for more information on Retail Cabinets and Display Items.